28-year-old Tom Ford captured PTC11 title by edging out Martin Gould in the decider the final. Congratulations for Tom's second PTC victory! Gould won the first frame on the black but Ford took the next two to lead 2-1 with 66 and 60. The Pinner Potter levelled and went on to make 127 to reach the match point. However, Ford managed to force a decider and came from 8-41 behind to win the match with 66 clearance in the decider. The PTC11 title is Ford's second PTC title after PTC3 last year. The Leicester man convincingly defeated the new UK Champion Judd Trump by 4-1 in the quarter-finals and whitewashed 2006 World Champion Graeme Dott in the semi-finals. "No disrespect to the players I beat to win a PTC event last year, but I count this one as a much better victory because of the players I've beaten," added Ford. "To beat the likes of Trump and Dott gives me a lot of confidence to go on and do well in the big tournaments. The runner-up Martin Gould beaten Anthony Hamilton in the semi-finals, who won the important battle against Mark Davis for Ronnie O'Sullivan. 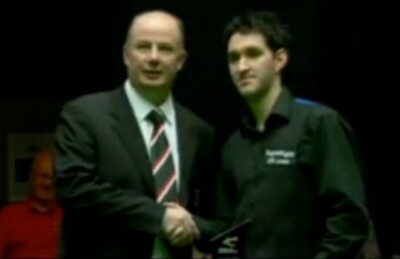 Mark Davis strived for knocking Ronnie out of Top 16 by a win in quarter-finals. Davis whitewashed Stephen Maguire in the last 16 but unfortunately lost to Hamilton in quarter-finals. That was so close for Davis but once again he finished 17th at the cut-off point. Ronnie is not yet safe to stay in Top 16 as Ricky Walden could knock him out if he wins the coming PTC12 in Munich next January. The unbeatable run of Michael Holt was ended by Martin Gould as well. 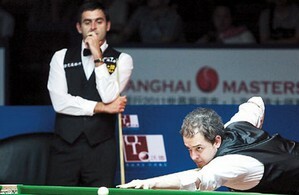 Holt created a record for 14 consecutive wins in the PTC events but Gould hindered The Hitman to write new history. The last PTC event of the season, the last 16 stage of PTC12 will undergo at Munich on January 6-8, 2012.